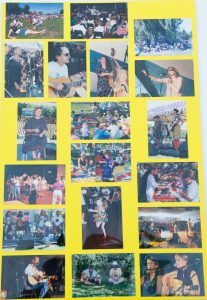 In 1996, the CKCU Ottawa Folk Festival flourished under the direction of Gene Swimmer and artistic directorChris White. 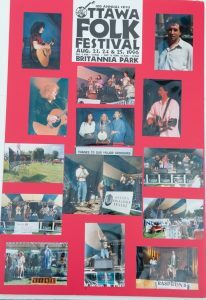 The festival made another natural progression, and expanded to three days of folk at Britannia Park (August 23 to 25). It continued to offer an eclectic range of performers and styles. 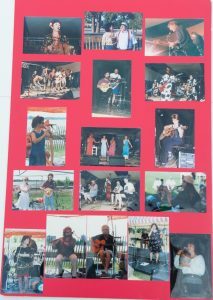 The main stage performers included Quartette, Bert Jansch, Lynn Miles, Moxy Früvous, Thomas Handy Trio, Laura Smith, Lennie Gallant, Danielle Martineau and Rockabayou, and Malaika. The year also marked the 20th anniversary of the Ottawa Folklore Centre. The Helen Verger Award was jointly presented to Colleen Peterson and Sylvia Tyson for their valuable contributions to Canadian folk music. Chopper McKinnon andKaren Flanagan McCarthy returned to host the main stage throughout the festival. The 1995/1996 Benefit Concert Series held at the National Library of Canada featured the following performers. Ottawa Folklore Centre owner Arthur McGregor started things off on the main stage with his acoustic guitar ragtime version of our national anthem. The Friday evening main stage opened with Les Hardis Moussaillons, an eclectic group of French-language performers with diverse influences: “rock, punk, flamenco and Latino thrown in a blender at high speed”. Montreal’s first lady of folk, Penny Lang, next graced the stage, followed by the exotic Latin American rhythms of Miguel Fenton. Songstress extraordinaire Lynn Miles performed to an appreciative crowd. Then the wild and wacky group Moxy Früvous exploded onto the stage. The evening of folk under the stars ended with the swirling sounds of Orealis, a Montreal-based Celtic band. The Saturday daytime entertainment was packed with talent. On the main stage you could choose from a country session hosted by Lonesome Paul, a bluegrass session hosted by Ron Moores, or a king-size performance of thePurple Dragon Puppet Troupe. For many, the highlight was the Ottawa Folklore Centre Tribute, celebratingthe centre’s 20th anniversary. Participants included Alex Houghton, Lynn Miles, Ian Robb, James Stephensand Bob Stark. Down by the water on the Point Stage, you could enjoy children’s entertainment with June and Kathy; aNortel Showcase with the Miguel Fenton Band; a world-beat session hosted by Dario Domingues; and anOttawa Folklore Centre session on how to play the harmonica. In the cool confines of the Inside Stage, the audience sampled a guitar session with Alan Marsden, Alex Houghton, Bert Jansch and Allan Gorman. A session on toe-tappin’ tunes hosted by Marion Linton set the atmosphere for the participatory dance sessions that followed. Catherine Burns hosted a contra dance with musical accompaniment provided by The Old Sod Band. Danielle Martineau hosted the lively Dansez! session with Rockabayou. The Red Stage was a showcase for singer-songwriters. The All in the Family session was hosted by the Bovine Sisters and included members of six families. The fabulous Laura Smith and George Antoniak were featured in a Nortel Showcase, while the Heart and Soul session hosted by Beth Ferguson featured Bert Jansch andPenny Lang. The session See What I Say featured the music and stories of Malaika, Jennifer Cayley, andRuth and Brian Bowen. Deborah Herr provided beautiful sign language interpretation combined with dance. The Green Stage packed a lot of entertainment into one afternoon. The Le Hibou Revisited session was one of the most popular of the weekend. Host Richard Patterson welcomed Sylvia Tyson, Colleen Peterson, Penny Lang and Bob Stark for an hour of recalling the glory days of the legendary Ottawa coffeehouse, Le Hibou. The Generation F session showcased a younger generation of folk artists. Bob Stark hosted the Writers are a Strange Breed session, exploring the art of songwriting. Two showcases featured Doug Reansbury andOrealis. Diversity was the theme on Saturday evening. The main stage opened with native singer-songwriter Willie Dunn, and continued with the bluegrass-fusion quartet The Emory Lester Set. Malaika, a four-woman a capella group that performs music from around the world, was followed by the Thomas Handy Trio. The trio combines a heady combination of jazz and East Indian rhythms to create music with an hypnotic effect. Up next was Quartette, a four-woman group that featured the considerable talents of Colleen Peterson, Sylvia Tyson,Cindy Church and Caitlin Hanford. Sadly, it would be one of Colleen Peterson’s last performances. Shepassed away barely six weeks later. British guitar legend Bert Jansch and the energetic Danielle Martineau and Rockabayou rounded out the eclectic evening. What better time to enjoy some gospel music than on Sunday morning? Host Andrea Karam introduced John Steele; Michelle Sweeney, a woman with a wonderfully powerful voice; and the many members of Voices of Praise, an Ottawa gospel ensemble. Other early birds were treated to devotional music from the Ottawa Shape Note Chorus, in a session hosted by Shelley Posen. Traditions old and new could be found on the daytime main stage on Sunday. A ceilidh hosted by Ian Robbboasted the likes of Ann Downey, Shelley Posen, Janet Munson, James Stephens, Wilf Gillis and Dan Schryer. Meanwhile, the New Traditions session hosted by Ann Downey featured Jimmy George, The Toasted Westerns and Night Sun. Stepdance Heaven was the title of a toe-tappin’ session featuring theOttawa Valley Dancers. The Ottawa Citizen Family Concert featured The Dinosaur Show with Kirk & Magoo. 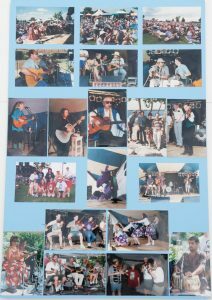 The children’s entertainment continued at the Point Stage with concerts by Magoo and Tom Plant. The sessionMusic from the Isles and a session on how to play the pennywhistle reflected a traditional theme. The session In the Groove, hosted by Suzie Vinnick, explored the art of grooving. Cabin Fever, one of the winners of the festival’s Last Chance Saloon competition, strutted their stuff out at the Point Stage. For those who took refuge in the air-conditioned comfort of the Inside Stage, there was plenty to see and do. A lively square dance was hosted by Fred Weihs, with musical accompaniment by Paddies on the Tundra. TheWords and Music session hosted by Alrick Huebener featured SugarBeat, thom barker and Aaron Zaadich. More words and music were examined in the Songs from the Heart session featuring Jody Benjamin, Lucie Blue Tremblay, Laura Smith and Lee Hayes. Nortel showcases presented performances by Night Sun, andGerry Griffin & Dario Domingues. The Red Stage was in danger of bursting into flames during the Fiddles on Fire session featuring the talents ofOliver Schroer, Janet Munson, Michael Ball, Pierre Schryer and Nathan Curry. One of the highlights of the day was the Maritime Stories & Songs session hosted by Shelley Posen and showcasing the talents of Lennie Gallant, Kevin Head and Tom Lips. More stories were shared during the Ottawa Valley Stories & Songssession hosted by Gail Gavan. Performers included Cal Cummings, Gord McAlpine, Tri-Lys, Le Grand Portage and Donna Stewart. The daytime sessions ended with a Nortel showcase hosted by Neema Mugalafeaturing the Sifa Choir. The Green Stage presented a session on blues music hosted by Larry “The Bird” Mootham and featuringRick Fines, Suzie Vinnick, Guy Del Villano and Vince Halfhide. Festival goers could also listen to Spirit Voices, a session hosted by Cliff Thomas. Willie Dunn, Stephen Augustine and Mary Carpenter performed music and told stories that reflected their heritage. Brenna Rivier hosted a session called Songs of Freedom, with participants Lennie Gallant, Lucie Blue Tremblay and Willie Dunn. Two showcases presented the talents of Steafan Hannigan and Jimmy George. The Sunday evening main stage opened with the fabulous sounds of the Folk Festival Children’s Choir. Celtic- inspired ensemble Jimmy George appeared next, followed by local favourites Finest Kind. This traditionally based trio consists of Ian Robb, Shelley Posen and Ann Downey. French-Canadian singer-songwriter Lucie Blue Tremblay performed a bilingual set. She was followed by Suzie Vinnick and Rick Fines. This duo combines the vocal talents of blues singer Suzie Vinnick with the guitar stylings of Rick Fines. The evening wound down with two superb East Coast performers: Laura Smith and Lennie Gallant. Laura Smith has been described simply as an actress who performs her own songs. Lennie Gallant is a native of P.E.I. who lives in Halifax. His music combines lyrics reflecting the struggles and dreams of real people with Acadian and Celtic influenced music.